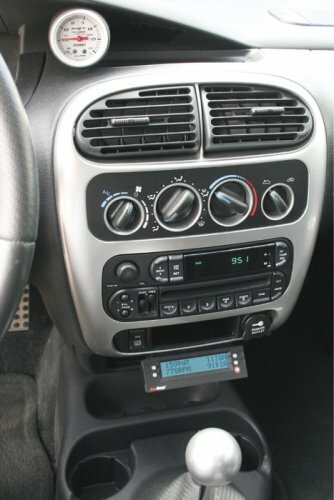 The ScanGaugeII is a compact vehicle computer that connects to the diagnostic connector and gives you an extensive trip computer, real time gauges and a trouble code reader. It can read fuel economy as you drive, tell you how fast your friend drove your car last night, tell you when you are going to run out of fuel and dozens of more things. Installation takes only seconds and requires no tools. Can be moved from car to car. Works on gas, diesel, propane and hybrid vehicles. Works on all OBDII protocols including the new CAN protocol. 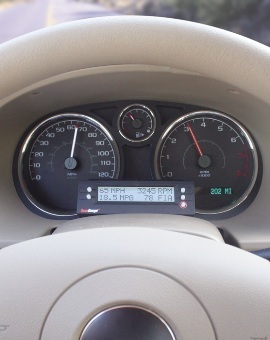 The ScanGaugeII is a 3-in-1 automotive computer that combines a multifunction trip computer, diagnostic scan tool, and up to 37 digital gauges in one small package. It connects easily to your vehicle's On-Board Diagnostic (OBDII) port and communicates directly with the vehicle's computer. Not sure if your car uses OBDII or Controller Area Network (CAN)? The unit will automatically determine which system to use and switch to it. The ScanGaugeII works on all 1996 or newer OBDII cars, including gas, diesel, propane and hybrid vehicles, as well as vehicles with the latest CAN systems. A detachable cable allows for easy transfer between multiple vehicles. Its menu-driven operation means there's no need to memorize complex sequences, and no tools are required for installation. The ScanGaugeII has been redesigned with expandable Add-A-Gauge (aka XGauge) technology. Add to the original 12 gauges by customizing the ScanGaugeII to monitor up to 25 more--depending on your specific vehicle's sensor design. Four gauges can be displayed simultaneously and can help determine fuel consumption rates, allowing you to adjust driving behavior and save gas. At the same time, keep an eye on coolant temperature, engine speed, and much more in real time. If there is a young driver in the house or friends borrow your car, the ScanGaugeII can record speeds of up to 158 mph and store the information for you to view later, so you will know just how fast your young driver or friend was going last night. If the unit was disconnected, you'll know: An indicator will be displayed in the trip data. ScanGaugeII mounts easily to your dash. The ScanGaugeII includes a diagnostic scan tool that can check for Diagnostic Trouble Codes (DTCs), clear the codes, and turn off the "Check Engine" light on 99% of 1996 and newer vehicles. (However, this feature may not work on some trouble codes in Dodge vehicles.) If any DTCs are found, the ScanGauge will show how many there are as well as the codes themselves. Then you can use the Internet or repair manual to find out which is the failed part is, so you can repair it yourself or know what needs to be fixed at the mechanic's shop. ScanGaugeII features 63 backlit colors. A large, high-contrast LCD display makes viewing the information easy, and both the display and keys are backlit and can be set to off, low, or high. With 63 possible colors, user settings, tank trip data, and vehicle settings that are automatically saved, and up to 10 user commands that can be stored and recalled, the ScanGaugeII can be easily customized to suit your needs. It has been 5 weeks since I installed and used the ScanGauge on my 2001 Diesel VW New Beattle. The install was a simple as the instructions and others online indicated. Placed the unit up onto of my dashboard and cover it with a towel during the summer heat. This helps with the adhesive. Following the instructions I fine tuned calibrated the unit using my GPS indicated speed to adjust to the tire size, not off enough to worry about. I also adjust the fuel used by refilling from the same pump each time and allowing the nozzle to simply shut off and not pump more. That has been a significant change in the accuracy of the unit as it was off nearly 20% in overestimating my fuel use. After three refills the unit seems more on the mark with my actual fuel use. While using the unit I initally tried the X gauge however the instant fuel used was not as useful as when I simply starting using only the calculated MPG per trip. This now has helped me to realize at least a 10MPG per trip improvement as I manually shift at the more appropriate times and smile quite large when after driving to or from work and see a typical 50+MPG for the trip when previous to the gauge I would often fill up to 35 MPG per tank. Last year when I was trying to stretch my gas dollars I came across this product as a reader of "[...]" - the "hypermilers" who had the most valuable tips. This education helped me to get a better mileage car, and then a gadget with instant read-out of my gas mileage. The Scangauge II may cost a little more than other gadgets, but then - this is a real computer with about 40 different read-outs, worth every penny. Not only does it give you second by second reading of MPG, but also battery charge, intake and water temp, RPM, and more. Above all it works as a code reader when the check engine light comes on. This check alone will cost you $50-$70 at a garage, so this Scangauge pays for itself in one or 2 readings. By the way, my average gas mileage for a 98 Toyota Corolla has improved from 32MPG to 35.70, or +11.5%. I'm still on an upside momentum and hope to get as many as 37 - 39MPG. it doesn't work on a '00 japanese Toyota Hilux 2.7L engine. I recently purchased a 2008 Mazda CX-9 due to a growing family. I really needed to drive as fuel-efficiently as possible to offset the poor mpg of this large SUV. This product provides real-time mpg data (as well as several other pieces of driving data). This product has made me much more aware of driving habits. Easy to use, Need to setup for correct reading. I like to try and squeeze all I can out of a tank full and this item does very little to that end. You can calculate your mpg yourself. Don't need to see some stupid fluctuating readout for this. I drive a Honda so the other info that the device displays is unnecessary. Lastly, You can have your codes read for free at most auto parts stores. BIG POSITIVE for Amazon - A refund was granted with no problems. The first unit shipped would not work w/ my 2001 Ford Sport Explorer. It was erratic from installation on a Friday until it simply did nothing. A call to the manufacturer the following Monday morning promised I would receive a replacement in a few days - with the time zone difference in my favor for shipping from Arizona to Massachusetts, I figured I'd see this by Wednesday. When ONE WEEK passed I called again on a Monday. "It shipped "Friday" I was told. The unit arrived later this same day (Monday). The replacement unit has worked flawlessly. In several emails I learned the replacement unit was modified by replacing two circuit board capacitors with ones having a larger value of capacitance, something the manufacturer found was necessary for Ford vehicles. My reason for four stars and not five is I do NOT believe the Ford resolution was found with my phone call and thus units should have been fixed prior to shipment. Recall units for fix? or wait until a customer with a Ford complains? Perhaps the magnitude of units in dealers' hands might prevent such a recall? Too few Fords using the product? Could be - but when you BUY a product, you expect it to work and not have to go through an exchange. Given I had paid for overnight delivery, had the replacement unit been shipped overnight (or arrived even in 2 days) I feel this would have offset having received a defective unit for use in my Ford. I recently got the Scangauge II after my order for a Kiwi MPG was canceled when the company couldn't provide the goods. While the Scangauge does cost about twice as much as the Kiwi, I believe it offers more in the long run. The Kiwi MPG does offer the ability to read multiple functions, but can only show one result at a time. The Scangauge can monitor 4 separate functions at once and show you all 4 at the same time. When you get the package you'll receive the unit itself and 6 feet of connector cable (roughly the diameter of a cable TV wire). You also get a couple Velcro pads and instructions. Here's an idea of how easy it is to hookup - first a spot to put the base unit, attach it to the dash using the Velcro (or a suction cup windshield unit if you have one), plug the connector into your OBD port, turn on the ignition, and then plug in the base unit. Takes all of 5 seconds once you find the OBD port (it was on the left side of my Yaris dashboard next to the fuse box). In fact it took me longer to figure out how to hide 6 feet of cable than to figure out the system itself. Instructions state you may have to wait 60 seconds or so for the unit to read your onboard computer, but it read mine instantly. All you have to do is enter the engine size information and approximate size of the gas tank (for me, it's 1.5L and 11.5 gallons). Information is held in memory by using your vehicle's trickle charge (in case you didn't know, your car is alive even when the ignition is off and a small amount of power courses through the vehicle). My choice of gauges shown includes average MPG, instant MPG, tachometer and vehicle speed. I've read some complaints that there appears to be a couple second delay on the information provided; however, my unit appears to have no real lag time. When I accelerate the tachometer responds along with the speed and mpg readings. For the most part, the speed on the unit is the same speed I show on the standard speedometer on the dash. What's amazing is the spread in instant mileage figures. When accelerating the unit will tell me I'm averaging 6 to 15 mpg but it can go as high as 80 mpg once at cruising speed (my average mileage is 40.6). At rest my car's rpm level seems to average 650 but at 70 it's closer to 2,700. It even told me that during certain times of cruising, especially with the cruise control on, the engine all but shuts down to save fuel (I discovered this when I checked to find out why the unit would read "9999" in the instant mpg area - the company told me it means the engine has literally shut down to save fuel and is cruising). Might explain why I get nearly 50 mpg on the highway. *	Instant and easy installation. *	Has the ability to monitor stuff you didn't even know existed. For the adventurous you can even go to the manufacturer's website to find additional measuring stats it can find for your particular vehicle. *	Nearly instant reading of requested information. At the worst, it maybe has a .25 second delay, if that. *	Doesn't wash out in direct sunlight and has backlight with various colors for night driving. *	Attaches via the OBD port and uses power from that connection - no need for external power source. Some other units sold require a hard wire connection to a power source. *	Not much bigger than a large pack of gum and not much heavier. *	Can reset diagnostic codes, such as the infamous change oil light nobody else will reset. Just one trip to the dealer to reset one of these can cost you $80 or more. On the downside, you have to do an Internet search to know what the code means on the display, but that's a minor inconvenience. *	Doesn't care what car it's in. You can swap it from one car to the next if you desire. *	Watch it enough and it'll help you to save gas and doing so becomes something of a game. I now try to accelerate in such a way that the rpm's don't exceed a certain level or I'll try my best to get an instant reading of 80 mpg. *	6 foot cable is hard to hide without taking apart the dashboard. My car has a sealed under-dash and this makes routing and hiding the cable a trick. I finally wrapped it around the steering wheel base a couple times and hid the unit in my driver's side glove box (you know what I mean if you're a Yaris owner). *	Manufacturer advises against direct sun exposure or it could overheat. In the Florida sun this means I have to hide the unit to avoid overexposure. *	It's wired, how about a wireless unit (in all fairness, a couple companies do make a wireless unit but they can cost over twice as much)? *	Pretty pricey, although it does replace a multitude of gauges that would probably cost me substantially more than $160. *	Included Velcro is barely enough, I ended up replacing it with larger strips. For Prius owners, this unit can also monitor battery state and condition (necessary for knowing in advance that the battery pack is getting ready to give up the ghost or is malfunctioning). For those of you thinking about getting the rear view mirror mount that is sold separately, be aware this means you have to snake the included cable through the headliner, down the side pillar, and then to the OBD connector. If you have side airbags like I do this is not possible due to airbag location. Also, some rearview mirrors, like the one in the Yaris, are too close to the headliner to mount such a device. If you don't want to mount the device with Velcro, just get a windshield mount usually used for cell phones or GPS systems. This thing has mystical mind-altering properties. Even though I have a car that gets really good mileage and I don't really care about increasing it, I can't help myself. My average tank mileage has increased from 33mpg to over 39 on the last tankful - 5mpg better than the rated highway mileage. I find myself trying to ignore it, but no matter what I do, it continues to affect my behavior. I want to accelerate the last few mph going up hills, but I just can't do it. Thankfully it won't work with my RX-7 - that would set up a conflict of immense proportions. Bargain, easy to install, works great! The Scan Gauge is a product that works precisely as described. Installation took 5 minutes, setting it up took about 15 minutes (mostly because I played around with all the really useful settings... ). Definitely a car junkie's favorite toy. I can monitor almost any function I want, right now it monitors water temp, rpm's, volts and instant mpg. Easy to get to the ave. mpg per tankful, just 2 button pushes away, not as difficult to use as some reviewers have stated. It saved me a $70 code read, and I found that I have no malfunctions at this time. Also, the unit can be rapidly unplugged, hooked to a second vehicle for diagnosis (and you can shut off the "check engine" light once you have repaired the issue), and returned to the original car in minutes. I recently got ambitious and decided to install a Scangauge II. I purchased this particular device because of the positive reviews it had on Amazon. My unit was a little over a year old and although it had never been previously installed I sadly discovered that it did not work in my 2007 Hybrid Highlander. Nothing at all appeared on the screen. It was just dead. I called the company in Arizona to find out how much it would cost to get it repaired. I was amazed when they said the repair would be free. After all the unit was a month or two out of warranty but they said this would not a problem. I sent the unit back to them last Tuesday, and on Saturday in four days I received the repaired (or replaced) unit. I was amazed by the prompt service. You can imagine how delighted I was when I plugged it in and it worked fine! I have been playing with the multitude of screens and settings possible. I took a brief drive and it seems to agree with my built in gauges but also includes much more information. I am sure it will help me desire to find the most fuel efficient route between home and work. I have several possible routes, but it is difficult to guess which is better for fuel consumption. It is not every day that a supplier impresses me with service! After this good experience I thought I owed the company a very positive review.